Welcome to the third rendition of nici wallpaper! This time its nici lion from the classic nici wild friends series. This nici lion is a mobile phone hanger, he's incredibly tiny like 8cm. His face is very adorable and has a hairstyle more like Simon Cowell than Jolly Ben (the Simon Cowell reference here). This classic nici lion picture was originally posted in facebook, the background is actually a cupboard and a curtain. 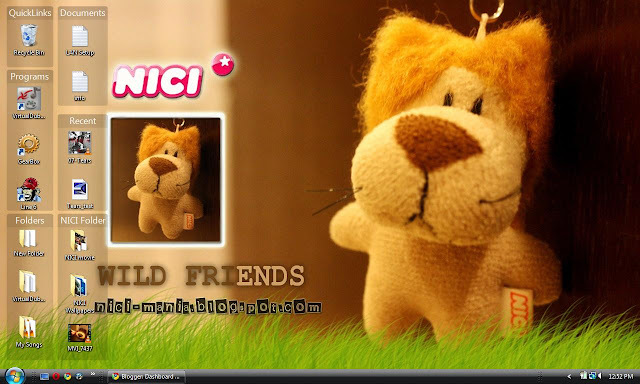 There are future plans to make another nici lion wallpaper from the newer nici wild friends series. Feel free to give any comments or suggestions for us to improve our nici wallpapers. We would be glad to receive any comments, criticisms or new ideas. It is really good and beautiful, as always!